Protein Blend (Heat Stable Whey Protein Concentrate [Milk], Whey Peptides [Milk and Soybean]), Natural Flavor, Silicon Dioxide, Sodium Citrate Dihydrate, Gum Blend (Cellulose Gum, Xanthan Gum, Carrageenan), Salt, Soybean Lecithin, Sucralose. Not intended for use by persons under 18. Do not use if pregnant or nursing. Consult a medical doctor before use if you have medical condition or before starting any diet or exercise program. KEEP OUT OF REACH OF CHILDREN. *MuscleTech is America’s #1 Selling Bodybuilding Supplement Brand based on cumulative wholesale dollar sales 2001 to present. MuscleTech researchers have taken a powerful amino acid formula and created a delicious-tasting heat-stable BCAA supplement to add to your favorite drinks – including coffee, tea or hot chocolate! Heating whey protein has traditionally been avoided in the past, as high heat can denature the sensitive micro-fractions that give whey many of its benefits, such as easy mixing without clumps. However, MuscleTech researchers worked with one of the largest protein manufacturers in the world to create a unique heat-stable whey protein product! It delivers a unique whey protein that has been refined using a groundbreaking, advanced ultrafiltration process before undergoing a unique manufacturing process that results in enhanced heat stability – making it one of the only wheys that can be used in hot beverages without denaturing or becoming difficult to mix! This makes NITRO-TECH CAFÉ a first of its kind and delivers whey protein to help you reach your goals, even while you’re enjoying a delicious coffee break! 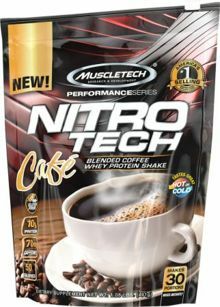 NITRO-TECH CAFÉ delivers premium whey protein that is manufactured using a unique process to develop heat stability properties. Whey protein is a fast-absorbing and easy-to-digest protein that has one of the highest tested biological values (BV) of any protein source. BV is a value given to protein sources to measure how well they are absorbed and used by the body. Each delicious serving of NITRO-TECH CAFÉ also delivers incredible macros, providing 10g of protein with only 2g of carbs and less than a gram of fat! NITRO-TECH CAFÉ gives you the original taste of freshly brewed coffee and the added benefits of premium whey protein. Our research team works closely with some of the top protein-flavoring professionals in the world, and NITRO-TECH CAFÉ is tested in multiple blind taste tests to ensure it’s the best-tasting formula available! NITRO-TECH CAFÉ features a heat-stable protein formulation that lets you enjoy it either as a hot or a cold beverage! To ensure a high standard of quality and purity, each batch of NITRO-TECH AMINO BOOST undergoes strict quality control and is third-party lab tested and verified to ensure that each bottle meets the highest standards of purity, quality and consistency.